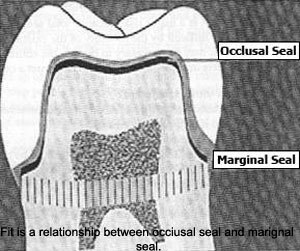 The fit of a full-ciown restoration is normally measured in relationship to two reference areas: (1) the occlusal’seat and (2) the marginal seal. The two areas are interrelated and affect each other. The ideal fit of a full crown (marginal discrepancy) is related to the film thickness of the cementing medium (normally10—30 μ). The clinical acceptance of marginal discrepancy is approximately 80 μ.